On November 2, 2010, Georgia voters overwhelmingly ratified an amendment to the state constitution that drastically alters Georgia law concerning agreements restricting the rights of employees to compete with their present and former employers. Before this vote, the enforceability of such agreements, which include agreements not to compete and not to solicit customers, depended upon their strict compliance with complex rules developed by Georgia courts. These rules generally were hostile to restrictive covenants and often rendered them completely unenforceable. Moreover, the rules almost always precluded courts from “blue penciling” (i.e., modifying) restrictive covenants to be enforceable. With the ratification of the amendment, the enforceability of future restrictive covenants will be governed by legislation enacted, contingent upon the amendment’s ratification, in April of 2009. The new legislation overturns the hostile and unforgiving rules courts previously applied and adopts a flexible approach to determine the enforceability of restrictive covenants. In so doing, the legislation provides presumptions favoring restrictive covenants that meet certain standards and permits courts to modify agreements to be enforceable when necessary. Under prior law, an agreement restricting a former employee’s right to use or disclose confidential information (other than trade secrets) was unenforceable unless it was limited in duration. If such an agreement omitted a durational limit, it was unenforceable per se (except as to trade secrets), and a court could not save it by restricting enforcement to a reasonable period of time. Under the new legislation, no durational limit is required for agreements restricting the use and disclosure of confidential information, and such information may be protected as long as it continues to have value and remains confidential. In light of this new legislation, we recommend that employers seriously consider having all existing restrictive covenants rewritten to take advantage of the more expansive protection against unfair competition that is now available. The new legislation will govern any restrictive covenant entered into after it becomes effective. Some attorneys believe the legislation became effective November 3, 2010, because language in the legislation expressly provides that it “shall become effective on the day following the ratification at the time of the 2010 general election of an amendment to the Constitution of Georgia providing for the enforcement of covenants in commercial contracts that limit competition . . . .” Under the provisions of the Constitution of Georgia, however, the amendment to the constitution that the voters approved this week will not become effective until January 1, 2011. Since the constitutionality of the new legislation depends on the amendment’s being in effect, we believe it would be prudent to implement new restrictive covenants on or after January 1, 2011. 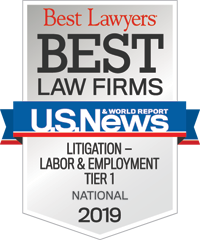 If you need assistance reviewing your existing employment agreements or drafting a new one, the attorneys at Constangy, Brooks & Smith, LLP are always here to help.